The Modjeska Theatre on Mitchell Street. Lake Effect's Bonnie North talks with the artists behind "Listening to Mitchell," Adam Carr and Sonja Thomsen. There are certain streets that reflect the changing characters of the neighborhoods which they traverse. Sherman Boulevard. Brady Street. And on Milwaukee’s South Side, historic Mitchell Street. 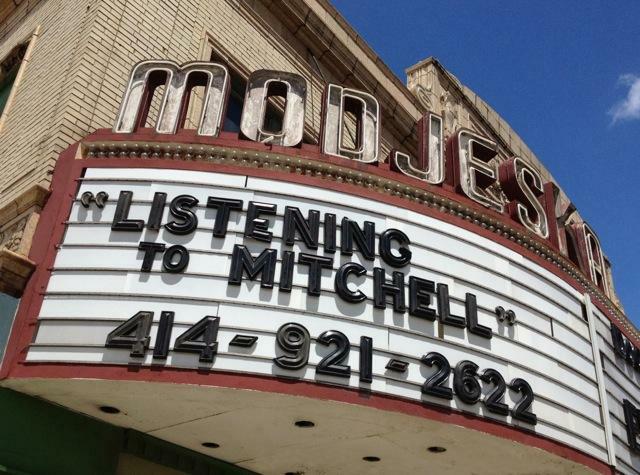 And it was Mitchell Street that drew Milwaukee audio artist Adam Carr and photographer Sonja Thomsen together for their second collaborative project, Listening to Mitchell. The duo first worked together on a project called Here Mothers Are, melding sound and visual storytelling. They’re doing the same thing in Listening to Mitchell. This multimedia art installation is set up along seven blocks of Mitchell Street. Over the next 14 weeks, Lake Effect will air audio postcards from the project on Fridays. But today, Lake Effect’s Bonnie North traveled to Lopez Bakery, on the corner of Mitchell and S. 11th Street to talk with Carr and Thomsen about the scope of the project, which really began over coffee and pastries at the same bakery.